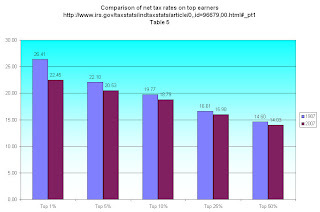 The effective or net tax rate is the amount of income tax we pay on our adjusted gross income. For many of us under 65, our adjusted gross income is our total income. The Tax Reform Act of 1986 eliminated many tax breaks and lowered marginal tax rates, which lowered the effective tax rate (ETR). 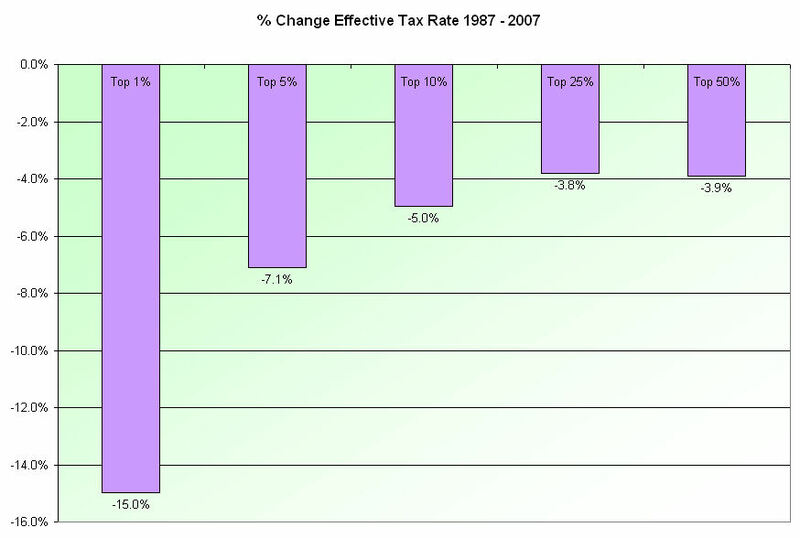 As a result of the act, the ETR for the top 1% of income earners dropped from 33% in 1986 to 26.5% in 1987. The IRS regularly publishes studies on various aspects of the tax system. 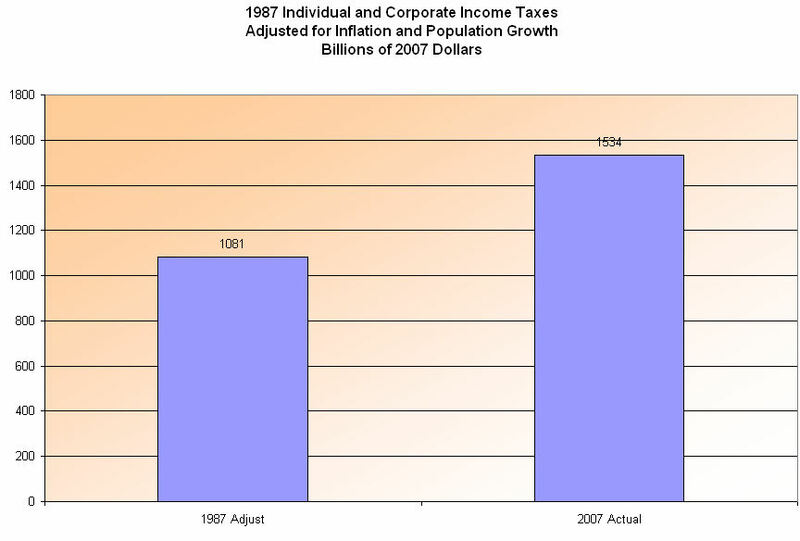 One of their studies, updated in July 2010, reviewed income and taxes paid for the period 1986 to 2007. Over the thirty years since 1987, the majority of taxpayers have made a beggars bargain by voting for politicians who promised lower tax rates. During that time, many taxpayers have received a tiny decrease in their ETR while top income earners have seen a 15% decrease. 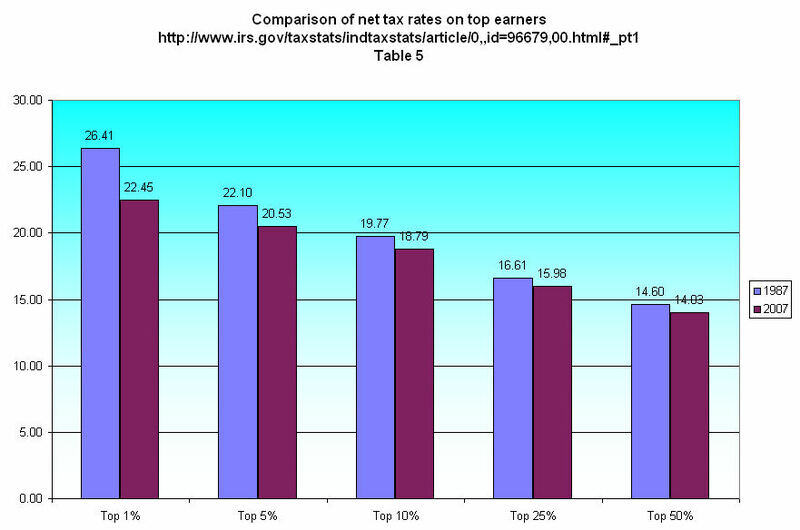 Below is a chart comparing the ETR for various income brackets in 1987, the year after the reform act, and 2007. 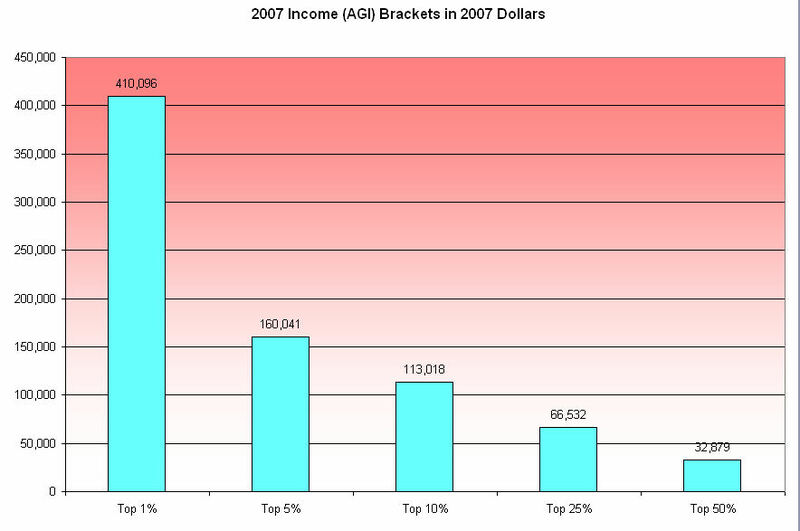 In 2007, what income bracket did you fall into? The chart below shows the top half of all adjusted gross incomes. If you made $33K or more in 2007, you were in the top half of income earners in this country. The highest earners have enjoyed the biggest reductions in their ETR over the past thirty years. During the past election cycle, there was much debate about increasing the marginal tax rate on the top incomes in this country. Republicans made significant electoral gains and quashed any attempts to increase taxes, resulting in a compromise this past December that left tax rates unchanged. Some voters objected in principle to ANY increase in taxes. Some voters objected in principle to an increase on only a small minority of taxpayers, maintaining that the tax pain should be shared so some degree by all taxpayers. The minority of voters who wanted the tax burden to fall heaviest on the upper income taxpayers might have been able to win the argument, particularly among moderates, if they had proposed an across the board 5 or 10% increase in income tax rates. An increase of 10% in a 35% income tax bracket is far more than a 10% increase in a 15% tax bracket. Instead, Democrats proposing a “soak the rich” tax policy change watched in horror as the electorate shifted Republican in many states. “Soak the rich” tax proposals seem to violate some sense of fairness in the American voter, even those who are not rich. In 1987, the Federal Government collected $392.5B in individual income taxes. 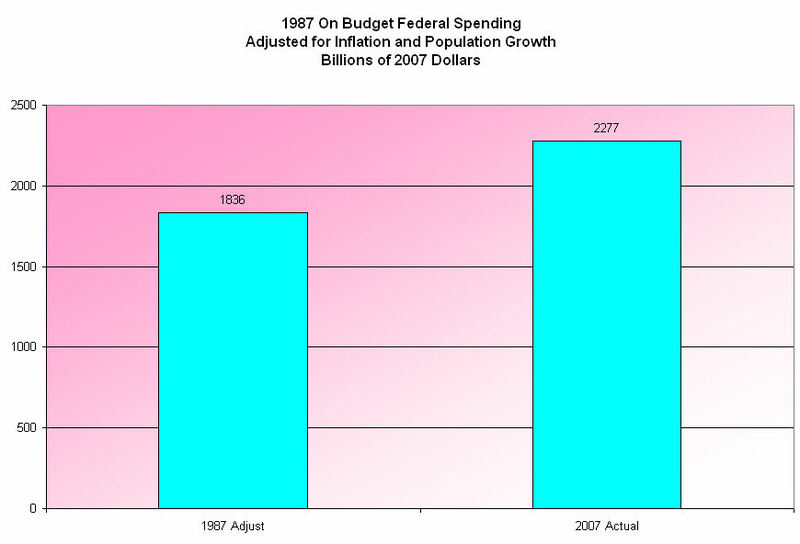 Adjusting for inflation (about 83%) and population growth (about 24%) from 1987 – 2007, that amount is $889B. What did the Feds actually collect in 2007? $1,163.5B, an increase of 30% over adjusted 1987 levels. In 2009 and 2010, income tax collections were about $200B less than 2007 levels, yet still about the same level as 1987. This country is running huge deficits each year simply because Federal spending has increased far more than inflation and population growth combined. Below is a comparison of 1987 individual and corporate income taxes adjusted for inflation and population growth with the actual taxes collected in 2007. Tax collections in 2007 were far stronger than the 1987 pace BUT the federal government is spending money at a faster rate than 1987. Below is a comparison of adjusted 1987 on-budget Federal spending – which excludes most of Social Security – with the actual amount spent in 2007. As Republican presidential candidates prepare to announce their candidacy, we can be certain that the debate over higher taxes vs. reduced spending will only heat up further. Proponents of higher taxes can point to the charts above and make a good case that the top 5% of incomes have enjoyed greater tax reductions than the rest of us over the past thirty years. Proponents of reduced spending can make a valid case that the federal government has just gotten too big. There is no resolution to the debate. Some people want the federal government to take a greater role in our lives – some don’t. The only “solution” is a compromise – cut some Federal spending, including defense, and bump up taxes an equal percentage on most American taxpayers.